I originally had a different post for today (you will see it tomorrow), but my human captured Binga in a surprisingly good mood yesterday morning. She woke up to this face, and took a few photos, one of which is above. She also shot some video so you could hear the audio of Binga purring. I figured that you would enjoy seeing (and hearing) her in a good mood, and not whapping anyone. So here you go — make sure your sound is turned on, and speakers turned up! We’ll return to our regular programming tomorrow. Mine Lady says that Miss Bing-Binga sounds exactly like DMM did when she purred! DMM was a loud purrer. That sure is a great purr motor. We love hearing and seeing Binga. Summer you are a star but Binga holds a big place in our hearts. My mom loves torties. Awww and of course, ‘Squee’! What a purrfect way to start your day. Binga’s face is showing the wisdom of many years lived. She is beautiful. Thanks for sharing her good mood with everyone! Awwww what a great way to wake up! Who wouldn’t love waking up to that face! Binga is so pretty. Your human should send that audio to other humans in places where they can’t have cats, like prisons and hospitals and stuff. It’s a beautiful sound, and if I couldn’t be with my own cat, I would love to listen to that. Mee-you Binga yur purr iss so luvley an comfertin! An yur foto iss luvley. Wishin you many more happy purry dayss! Mesi! Mesi! Come here – watch Binga. This is what a soppy tortie should be like. Now why can’t YOU be like that with me ? Ooh yay isn’t she just the best!!!!!! Binga has a pretty good motor going there! I love that pose, where a kitty rests her chin. That’s always a cute pose! OMC! A double purr! Binga is a rock star! Binga has a very fast purr. Beautiful Binga…we love her so much!!! Awwww…..what a sweet purr Binga has. Sweet photo of Binga – Now can we have some Boodie? Binga, I need some of that purring to help heal my broken finger bones…will you come over and help? Awwww, Binga! You are such a sweetie. Aw, we LOVE that! See, we knew Binga was a happy cat! That is so sweet. Our people live for these moments, don’t they ? 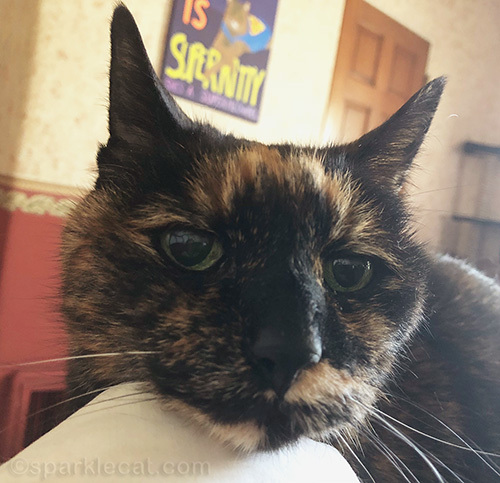 OMCs Summer thank you so very much for sharing this post of the most loving blinkie eyes and purring of Binga the lovely Tortie. OMCS she was in such a good an loving mood with your human. That was . . . thrilling! So rich and mellow. A purr for the ages. My little heart went thumpity-thump. It’s so nice to see Binga’s face! Binga, you are looking mighty good, and the purr is just terrific. Good to see you. Well that’s a mighty nice and welcoming sound to wake up to! A purring and happy Binga! That is one sweet purr beautiful Binga! My human loves to hear me purr. I usually purr for her wake up alarm. Binga is a good wake up purr too. Nice to see Binga again. And we love her purrs! Nothing like waking up to a happy,purring BInga! Binga is beautiful and itâ€™s great seeing her in a good mood. Thanks!